Fitbit. It’s not the new word on the street to call a bit of hot totty, but an awesome new little gadget that’s been launched in the States in the last year. 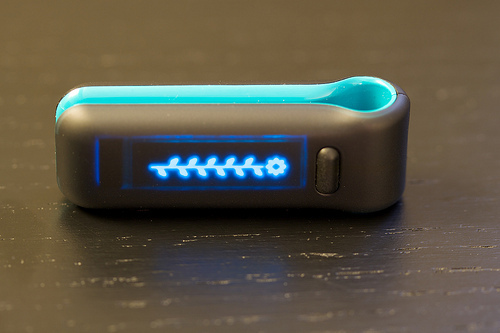 A very fancy pedometer, it’s as much a motivational device as it is a fitness tool. Containing a 3D motion sensor, the fitbit tracks your calories burnt, steps taken, distance travelled and sleep quality as long as you remember to wear it. You can connect it up with your social networks but balls to all that oversharing. 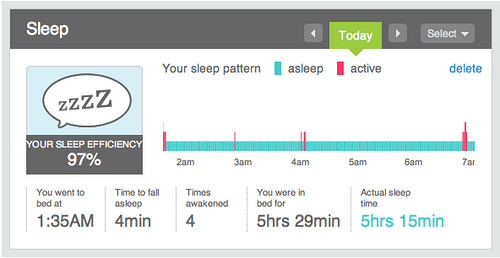 Instead I’d be perfectly happy keeping my data within fitbit’s own, pretty great on first glance, social network. It tracks your progress over time, weight, foods, and allows you to set goals and see how your friends are doing – thus adding another motivational factor. I’m particularly interested in the sleep efficiency as it takes me forever to get to sleep once I’m in bed and it would be good to see it monitored. I’m feeling very motivated and am going to be doing a lot of diet / fitness activities over the next month in the hope to have more energy for Glastonbury. Unfortunately, fitbits are so in demand that there’s a month backlog of orders. Still, one is about to be ordered and will hopefully be with me late June. If you want one, they’re $99, but you’ll have to get a mate in the US to sort it out though, as they’re currently only available to order to American addresses. Rick Springfield’s ‘Jessie’s Girl’ isn’t a song that I’ve really grown up with. Despite being a Grammy award winner and Billboard #1 in the States in 1981, it only reached #43 here when it was released 3 years later over here. So I’m not really sure how big this song is in the UK, if anything it’s probably Guitar Hero that’s secured it’s enduring popularity. Personally I think I only first heard it a couple of months ago when Lucio played it at ‘I Built This Speedwagon on a Prayer’ (a power ballads night at The RVT that we run) and then soon afterwards I watched Boogie Nights in which it features. Since then I’ve been list ening to it A LOT and played it again at the latest Speedwagon last week. Once the Madonna episode of Glee aired, a lot of people suggested they’d foolishly left out the schmaltzy ‘Dear Jessie’. Instead it seems Jesse St James was definately named for a reason, but it’s so they could bring Rick Springfield into play. When ‘Laryngitis’ airs in the UK on Monday I’m pretty sure that the #43 chart position is going to be smashed to pieces. 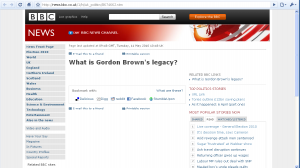 In fact it’s probably the most hit heavy episode of the sadly fading Glee. There’s not very much action but brilliant song after song is banged out with two non Rachel based duets in particular absolutely nailing it. Did Nick Robinson commission this page?